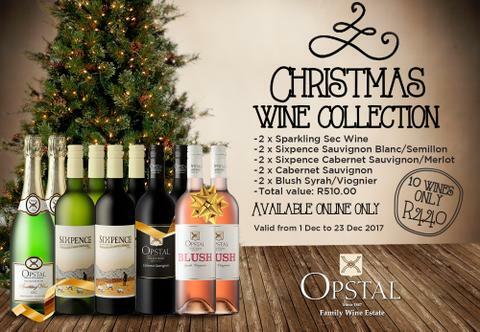 This festive season you can spoil your family, friends and yourself with our Christmas Wine Collections. This is only a ONLINE SHOP special. So go have a look at our Online Shop deals. Offer ends 22 December 2017 or while stocks last. Christmas is a great event which spreads joy and pleasure. It is celebrated to commemorate the birthday of Jesus Christ who is believed as the originator of Christianity. Celebrated each year on 25th of December in the winter era. It is observed as Christmas Day to honor and give honor to Lord Jesus Christ. People take pleasure in the Christmas holidays all during by dancing, partying, singing and going outside for dinner. Though Christmas is the fair of Christian society the joy and pleasure related to it makes it the fair of each one. People visit Church and present prayers to the Lord for his blessings on this day. People wish ‘Merry Christmas’ to each and all give out gifts in order to create the celebration joyously. The preparation for the fair starts well in advance and people cook cakes and a range of other cuisines. On this day, homes and churches are much decorated using flowers, tinsels, lights, sparkles, ornaments etc. Markets also seem very striking during the event with full of Christmas cards, gift items, toys etc. There is a very old custom of decorating Christmas tree on Christmas. Trees like spruce, pine, fir or mock trees are used for the decoration. People take pleasure in beautifying their houses with the Christmas trees. It is with lots of sparkles, tinsels, gifts, balloons, lights etc to make it seem bright and stunning. People also place cotton for the look of snow and to create it look more sensible. Christmas is a fair of great passion and rejoice which is enjoyed by each one all over the world. Jesus Christ worked for the change in the lives of the people. He gives a new way of life to the world and Christmas assists to celebrate the big day when Jesus took birth on earth to keep mankind from evils, sins, and sorrows.